Music & lyrics by Adam Equation & Ian Cinch-Jones. ©1996, 1997, 1999, 2000 ERSATZ AUDIO. 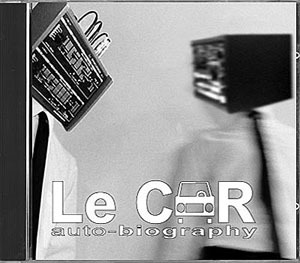 ©1997 Le CAR, CRAFT RECORDS. Le CAR member Adam Equation is now a member of ADULT. Le CAR member Ian Cinch-Jones is now a member of Perspects. "...so much funk that it almost becomes unbearable,... It is also, of course, absolutely hilarious, as if that needed to be said. HIT!" *Please note: There was a track listing error on the back of the initial pressing of the Le CAR CD. The track list above and the grid list on the inside of the booklet are both correct.